Andre Burakovsky, Nicklas Backstrom and Lars Eller each scored, and Braden Holtby finished with 25 saves as the Washington Capitals extended their winning streak to six games with a 3-0 victory over the visiting New Jersey Devils on Friday night. The victory pushed Washington into first place in the Metropolitan Division with 87 points, two ahead of the idle New York Islanders. The Pittsburgh Penguins sit in third place with 81 points. Burakovsky scored early in the first period, and Backstrom and Eller added their tallies in the third. 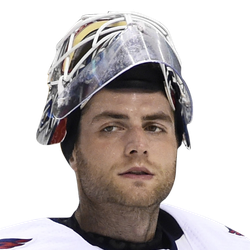 Holtby improved to 6-1-0 in his past seven games. Washington's Alex Ovechkin did not get a point, and he remains just one short of the 1,200 mark for his career. He'll become the 49th player to reach that milestone. New Jersey dropped its fifth consecutive game. The injury-riddled Devils got some good news when Kyle Palmieri and John Quenneville both came back to the lineup after missing time. New Jersey now has lost over 250 games to injuries, and it had eight players out due to injuries or illness on Friday. Burakovsky, who has been heating up lately, gave Washington an early 1-0 lead on the Capitals' first shot of the game. Michal Kempny came up the middle on a rush, took a pass from Travis Boyd on his right and quickly fed Burakovsky on his left. Burakovsky then put it past goalie Mackenzie Blackwood 2:40 into the game. Burakovsky now has a goal in three consecutive games and three goals and two assists in his past six contests after some speculation that he might be dealt at the trade deadline. Neither team scored after that until the Capitals made it 2-0 early in the third period with a power-play goal. John Carlson snaked a pass through traffic to Backstrom, who deflected it past Blackwood from the edge of the crease at 4:35. For Carlson, it was his 49th assist this season. Evgeny Kuznetsov earned the secondary assist on that goal, giving him 43 helpers this year. Eller then added a short-handed, empty-net goal in the final minute.